Many parents ask us about how they can get financial aid and scholarships for high school seniors throughout the Phoenix metropolitan area. Is there even enough out there for me to get some? Well, did you know that…. billions of dollars in college scholarships are given out each year!? Yes, BILLIONS of dollars! Many times schools will just hand you the scholarship money to use as you wish after your tuition has been paid off! Based on our experience as students ourselves (who attended UCLA and ASU) and helping counsel students all over the Phoenix, Arizona area, we know one thing is for certain: if you apply to enough, and know key ways of how to bolster your application, you will get some! So here are some tips and websites to help you get started on your pursuit of scholarships for college. After reviewing these below, get a free scholarship e-guide with even more specific tips and tricks. Step 2: Talk with your career counselor to see what local based scholarships are available. Why should you go to your career counselor? They should have a basic idea of scholarships available for you. Many times they will have a sheet showing the scholarships available, due dates of the scholarship, and amount awarded. They have access to the local-based scholarships that many of the larger companies like Fastweb & Zinch do not. **Not many students apply to the local-based scholarships, making your likelihood of obtaining one higher! Step 3: Start applying to scholarships as they come your way! Step 4: Score as high as you can on the PSAT (qualifying year is junior year for most students). Simply qualifying as a National Merit Finalist or Semi-Finalist opens many doors to free money! Read more here. Many scholarship applications require minimum SAT scores to qualify…and/or higher scores impress those who are deciding to whom to award the money. 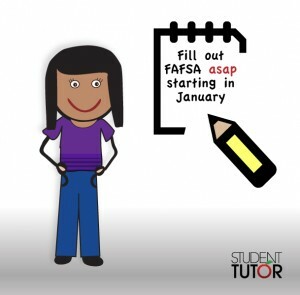 The official website is: http://www.fafsa.ed.gov/. The FAFSA form allows you to apply for receiving a part of the more than $150 billion in federal grants, loans, and work-study funds. It can be filled out on paper or online, but online is faster and easier. Overall, the best advice is the sooner the better! Those who wait too long may find funds dried up even if they meet the final deadline for filing the FAFSA form. Note: There is also a www.fafsa.com, but that appears to be a company you can pay to file things for you. We have no experience with it, so cannot recommend the .com site one way or another. Fastweb is an effective online resource to help high school seniors and their families pay and prepare for college. They match you to relevant scholarship opportunities completely free of charge. With roughly 1.5 million scholarships worth over $3.4 billion, there are scholarships for every student’s educational goals, activities and interests. Fastweb members can receive insider financial aid tips and job and internship matches in their area. Zinch lists scholarships that are creative, easy, and fun to apply for and win. An example of a fun, unique scholarship to go for is the Weekly Three Sentence Essay Scholarship where applicants must generate a 280-character essay (or about two “tweets”) to vie for $1,000. You can also see your likelihood of being accepted to your university choices or not. Parents and students ask all the time about how best to tap into the available financial aid and scholarships for high school seniors looking to go to college and afford it. This above is where we would highly recommend starting. If you know of more great tips and websites to help our families in the Phoenix, Arizona area pay for and prepare for college, let us know! We will gladly add it to our list of resources.